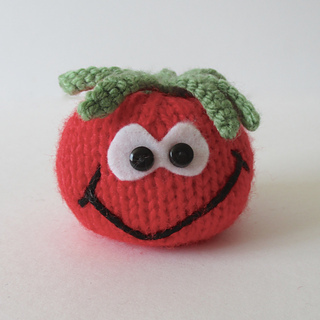 The tomato is approximately 4.5cm tall and 5.5cm diameter. 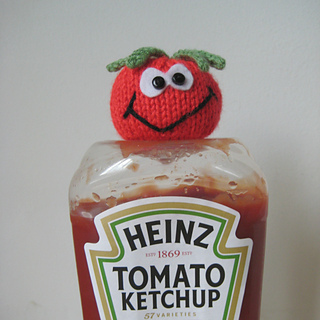 Without tomatoes we wouldn’t have ketchup, baked beans in tomato sauce, and pizza would be so dull! So thank you tomatoes for cheering up our meals! 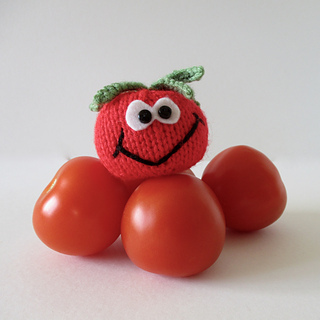 This free knitting pattern is for a happy little tomato …. 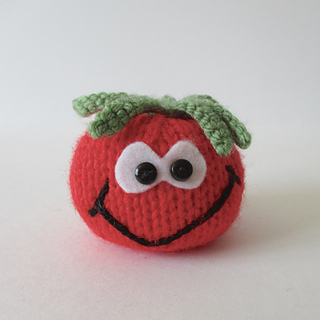 this knitted tomato is life-sized, it would be a super way to encourage kids to eat their fruit and veg. THE PATTERN INCLUDES: Row numbers for each step so you don’t lose your place, instructions for making the tomato, a list of abbreviations and explanation of some techniques, and recommended yarns. The pattern is 2 pages and written in English. TECHNIQUES: All pieces are knitted flat (back and forth) on a pair of straight knitting needles. You will need to cast on and off, knit, purl, work a kfb increase and a k2tog decrease, and sew seams. I have no objection if you wish to make tomatoes to sell to raise funds for charity. However please do not reproduce or sell this pattern.